ABOVE: The Hotel Santa Chiara is at the edge of the Piazzale Roma, near waterbus platforms and the Calatrava Bridge to the railroad station. INSET BELOW: A fondamenta or waterfront sidewalk next to the hotel. You have an early flight, you're departing on a cruise the next day, or you're traveling by car. 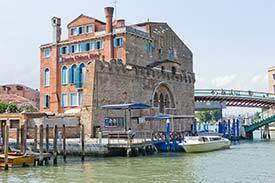 The hotel and its annex are within a minute or two of Venice Airport Buses, Treviso Airport Buses, land taxis, and the People Mover tram to the Marittima cruise basin and Tronchetto parking garage. The railroad station is just across the Calatrava Bridge from the Hotel Santa Chiara, and the hotel's Resizenda Parisi has private parking for cars and motorcycles. The Santa Chiara is unusual in having an ISO 9001 quality-management certification--something you might not expect from a hotel that's housed in a 500-year-old palazzo. The hotel is also accessible to guests in wheelchairs. In the first image, look for the Hotel Santa Chiara in the upper right corner of the Piazzale Roma, near the bottom of the frame. The second image shows the Santa Chiara in close-up, with waterbus platforms nearby and the Calatrava Bridge just to the left of the hotel.